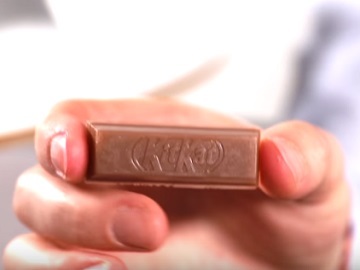 Kit Kat presents, in its April Fool’s Day commercial, the “cleanest, tastiest, break of your life”: the KitKat soap. The ad informs that the edible KitKat soap comes in three different sizes: KitKat Bites, which is designed for on-the-go use and is perfect for sharing with family and friends, KitKat Four Finger, which is a classic clean break and experience with snappable individual fingers just like standard KitKat, and KitKat Chunky, which is effective for the toughest breaks and for a real chunky deep clean. Another thing specified in the spot is that what the KitKat soap gives is “the holistic cleansing experience”. The chocolate brand has also released a press release, announcing that the KitKat soap range is “due to be on shelves (and in baths and showers) everywhere later this month”, but don’t expect to find it in stores. Among the other pranks from brands this April Fools’ Day are the golden box logo apples from Lidl sold for 39,99 EUR (approx. $49 USD), with an advertisement that reads “Only While Supplies Last”, Brewolingo, a beer from language app Duolingo, described as “Craft beers from America’s Owliest Brewery to help you get fluent in any language. Containing a special blend of Owlcohol and Owlgorithms”, the Chocolate Whopper from Burger King, the smartshoephone from T-Mobile, and others.